The SenseOCEAN project has made many technological advances during the last 4 years - a few of the major highlights (updated 13th November 2017) are shown in the flyer below (to download, click on the image). Four SenseOCEAN partners, Chelsea Technologies Group, nke instrumentation, TU Graz and the National Oceanography Centre, came together in December in Southampton to carry out real time testing of the Modbus - EMAP iridium module with the optode and lab-on-chip sensors in the Southampton docks. 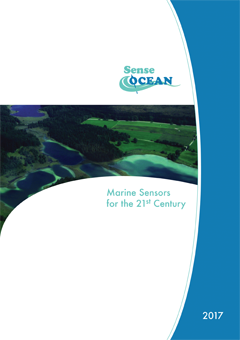 This initial SenseOCEAN policy brief outlines the contribution that the SenseOCEAN project will make towards monitoring the achievement of the UN Sustainable Goal 14 objectives. It highlights some of the challenges faced in trying to conserve and sustainably use the oceans and marine resources and the sensors being developed by SenseOCEAN to monitor progress in these areas. SenseOCEAN will be at the Oceanology International exhibition and conference to be held from 15-17 March 2016 in London, UK (see OI website for further details). SenseOCEAN scientists will be presenting some of their latest developments at the next ASLO Ocean Sciences Meeting that will be held from 21st-26th February 2016 in New Orleans, US.